All buildings age. Not all buildings age well. How can we design buildings to age with grace? A lasting building needs to withstand the elements and adapt to shifting user needs. Buildings which fail to do so increase the cost of housing while contributing to instability for low-income renters. This competition entry proposes a model for affordable housing in NYC which becomes more valuable as it ages, in the same way patina that adds to the character of weathered surfaces. Brick and copper are used for their durability and because they acquire character, or patina, as they age, therefore reducing maintenance requirements for the building. A rent-to-own scheme and easily remodeled spaces gives tenants control over their housing and encourages investment. An innovative open-web waffle slab allows for maximum flexibility when routing mechanical, electrical, and plumbing services. Collaboration with trade schools provides the expertise required to design and build partitions while offering an educational opportunity for students. 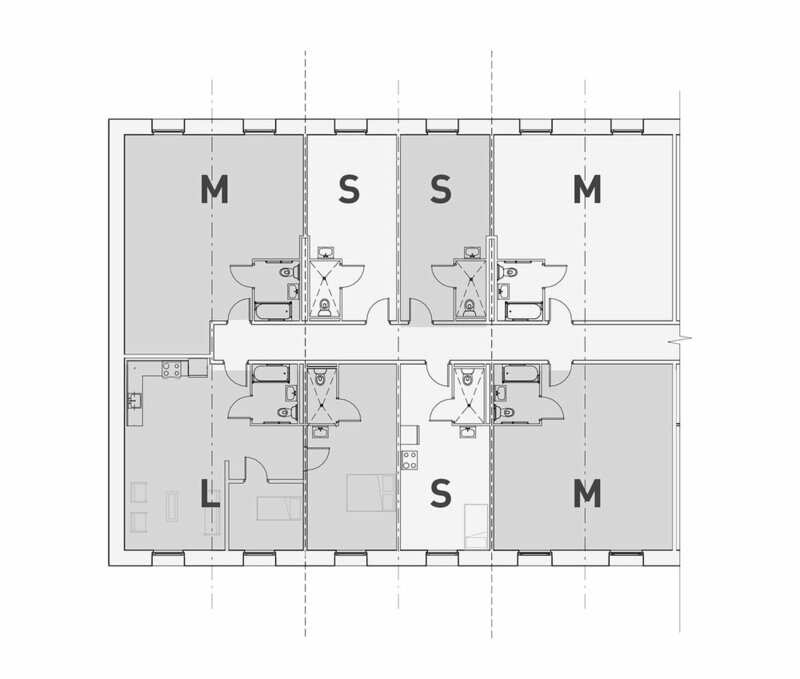 Ground floor communal areas can be used as workshop and studio space for students. And users make updates to finishes and partitions as time, finances, and needs permit. Rent and fees are proportional to size to allow for expansion, simplify downsizing, and to facilitate aging in place. A family of three qualifies for a rent-to-own loft unit. With the comfort of knowing they will eventually own the unit, they invest time and effort into customizing the layout. Initially, the family creates an efficient 2 bedroom unit. Small personal touches, such as a rounded corner to the bedroom, are added over time. In the years after their daughter moves out, the owner removes two partitions to convert the space into a 1 bedroom unit. How can a forest become a sanctuary for families experiencing homelessness? The city of Austin, Texas, struggles with a growing population of families experiencing homelessness. 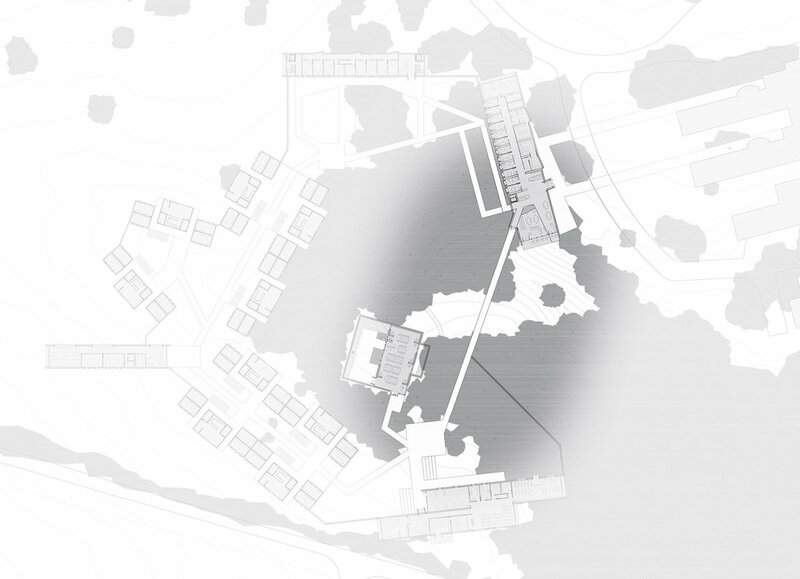 Working closely with a psychiatrist, an architecture firm known for their work in shelter design, and interviews with social case workers, this academic studio developed a model for a decentralized shelter system, with small sites throughout the city. We presented our findings to the Austin City Council. In this network, the Sanctuary for Austin Families (SAF) would serve women and families fleeing unsafe living conditions. Nestled in a forest near an existing family shelter, the inward-facing courtyard design of the campus provides a feeling of protection. 1 Families are registered in the existing shelter. 2 Upon entering, the space opens up to a heavily fenestrated interior wall with views of the forest. The building contains a public living room and caseworker offices. 3 A bridge takes the family over a natural gully and through the canopy of a live oak forest. The proces of crossing bridge emphasizes the feeling of sanctuary. 4 Tucked in the forest is a multipurpose building that serves as a library and a place for spiritual reflection, as well as a school. 5 Families reside in the village in groups of rooms that share a kitchen and living space. Buildings resemble detached housing typical of Austin to ease the transition into and out of the shelter. 6 The resource center contains computers, laundry, and classrooms for adult continuing education. To the north there is a medical center. 7 The shelter draws heavily on the existing live oak forest as a resource for relaxation, reflection, and play. Buildings are situated around its edge to minimize trees lost. 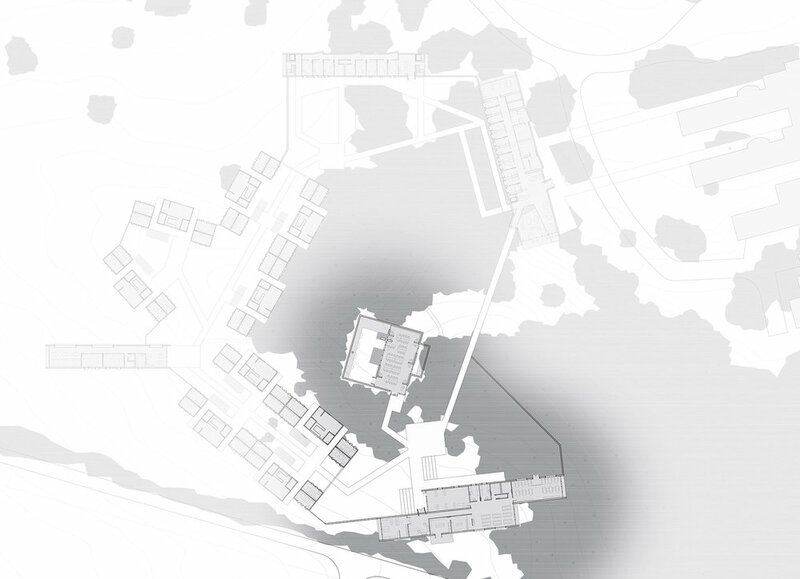 Spaces that contain resident services are housed in elongated concrete buildings with gabled roofs. The form serves as the perimeter wall, emphasizing the feeling of enclosure and protection. Gable roofs hint at a classic house motif, but gently open at their apex to provide natural light. The main building provides access to the bridge, which leads to the residential areas of the site. In the center of the campus where the bridge ends, a multi-use building serves as a library and non-denominational spiritual center. Embedded in the forest, a simple grid structure supports vertical steel columns that lift the roof above the entry and altar. An enclosed garden provides a calm, quite place to spend time outside. Based on research and interviews with caseworkers, living spaces are designed to provide varying levels of privacy for residents dealing with trauma. Individual rooms are separated from the shared living spaces to emphasize a sense privacy. Shared living rooms provide a space to socialize in a controlled setting with familiar faces. Finally, covered outdoor porches connected to public elevated walkways provide an area to encounter residents from other units. Units are modeled after detached housing typical of Austin to ease the transition back to independent housing. The main findings of the studio are twofold. First, there is no “one-size-fits-all” approach to homelessness, so shelters need to provide flexible living arrangements and a range of supportive services. Second, concentrating services in single, large facilities is stressful for both the residents and the communities that support them. With a decentralized system, residents can navigate the traumatic experience of homelessness in smaller, more personal, and more dignifying shelters. In response to the waste typically generated by temporary installations, a pavilion is designed to be taken apart and converted into public furniture. With the prompt to design a plaza for 1 million people, our strategy was simple: create an installation where people can learn basic construction techniques and furniture design through direct observation. A rigid pyramid is erected in the center of the pavilion. Prefabricated ribs made from uncut 2x8 lumber are placed around the core. 2x8 Flooring is placed, functioning as both diaphragm and walking / working surface. Craftsmen remove ribs from each wing in sequence and transform the material into furniture. As deconstruction and fabrication continue in tandem, an improvised public space emerges. At the end of the festival, over 150 items of furniture have been built, and the pavilion is completely disassembled. Careful attention was given to the design of the main structure to minimize waste. All board lengths are multiples of 18”, and the furniture is designed to only require 18” segments of board. Our ultimate goal is to give observers the confidence to design and build their own furniture from recycled materials. The installation is designed to become a part of the public space around it. During this process, visitors observe how to make furniture of their own. When they return home and share what they learned, the influence of the pavilion spreads.